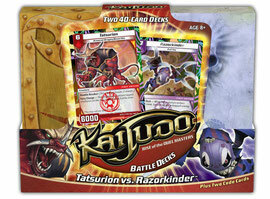 Wizards of the coast recently released (or rather, re-released) Kaijudo, a "new" Collectible Card Game built with a younger gamer in mind. I say "re-released" and "new" because some people may remember it as Duel Masters, which WoTC published and released from 2004 to 2006, in conjunction with an anime cartoon. Duel Masters had mild success, and was an interesting game. Those who liked it, will most undoubtedly like Kaijudo, as it's essentially the same game, with a more "fresh" update to the artwork, some new mechanics on the cards, and of course, a new cartoon to go along with it! Let's take a look and see how this version, Kaijduo, stacks up, both from my point of view, but also, from the point of view of my littler gamers, who play it with me! I'm joined in this video by NinjaZach and Giant-Wyatt, my two little resident card flippers, and they too will give you their thoughts! Enjoy!